An eleven unit multi-family in Fort Greene. Projected Cap Rate 5.21% call for more details. 218 Cumberland Street is Five Story Romanesque Revival/neo-Renaissance style property located at the apex of Cumberland Street and DeKalb Avenue seconds from the entrance of Fort Greene Park. Landmarked as a part of the Fort Greene Historic District in 1980 his unique property has varied possibilities for the right owner. Designed in 1895 by Brooklyn architect H.L. Spicer to house six families it is currently configured as a 10 unit property. 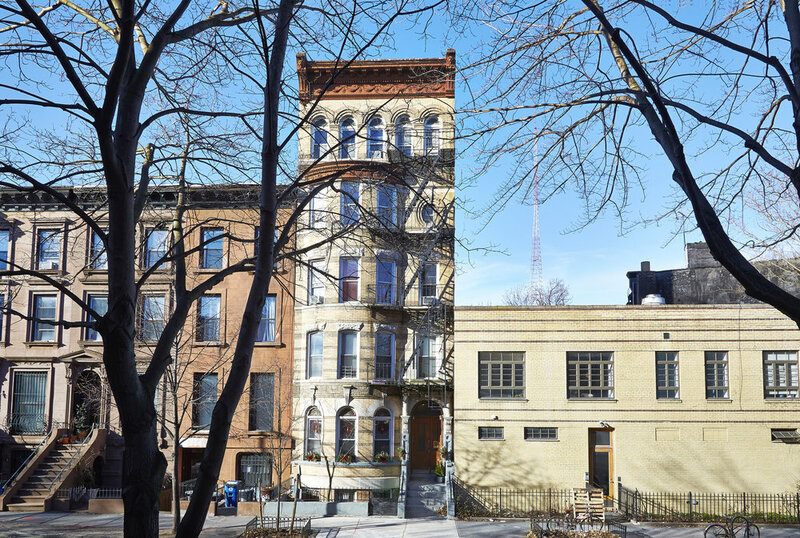 The building is 22ft wide x 80ft deep on a 100 ft lot and sits at the crossroads of Cumberland and DeKalb offering a very short distance to Ft Greene Park. The same family has owned the building since 1969. 218 Cumberland features a distinctive four-story swell-bay topped by a balustrade. The fifth-floor facade contains an array of five round-arched windows with stained-glass transoms. The galvanized-iron cornice on the roof decorated with swags and rosettes and the galvanized-iron cornice of the bay are just a few of architectural features of note on this glorious building. The property currently has eight tenants with three apartments to be delivered vacant. For more details and a setup sheet, please contact the listing agent. Property sold as-is. Transportation: It is a five-minute distance from the Atlantic and Pacific street subway stops servicing the 2,3,4,5, D, Q, R train and LIRR and 5 min from A, C at Lafayette Ave. All major downtown bus route travel on Fulton.